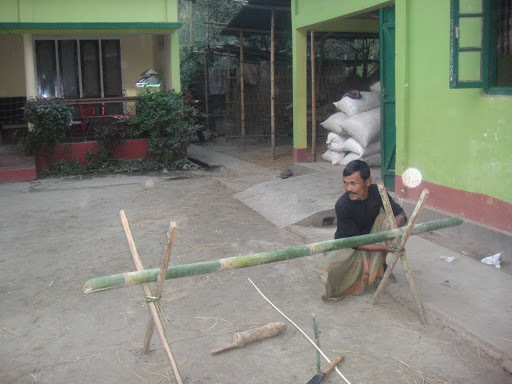 Bhogali Bihu Of Assam …..Uruka Bhoj And Making Of Sunga- Pitha. I was away from blogger for sometime as i was on a vacation….Just like every year this year too me and my family celebrated Bhogali /Magh Bihu in our village house.Namkhola is a small village near Mangaldoi in Assam.Bhogali bihu is a harvest festival which marks the end of winter harvesting.The term Bhog means enjoyment,merriment and luxury…this is the time of the year when granaries are full .There is lots of feasting and enjoyment all over the Assam during this time (mid Jan to mid Feb).The same festival is observed all over India as Makar Sankranti/Pongal/Lohri .We usually reach Namkhola on the day of Uruka i.e. the eve of Sankranti. On this eve people organise Bhoj(feast) either within the family or in groups.We like to keep it as an only family feast.This year as my daughter’s school was open on the day of Uruka ,we left for our village only after lunch ,so by the time we reached there it was almost dusk.It is almost a two and half hour drive from Guwahati,on our way we saw more than hundred Mejis and few Bhellaghars (I will explain to you about them in my next two posts).Above is one such picture of an unusual Bhellaghar built by the people of a village we crossed. As we reached our home we saw Nirah making arrangements for the preparation of Sunga-Pitha.Well I must explain here that Pithas are special delicacies prepared in many forms by various methods like steaming,frying or by baking over a hot plate.Special skill is needed to make Sunga Pitha.Sunga means Bamboo.The Bamboo is cut into the desired sizes as shown in the pictures below. Bora Sawal( a special variety of rice which is very sticky in nature and has a very unique taste and aroma) is the main ingredient of this recipe…..the rice is pre -soaked and the Sungas are washed .Because this pitha is cooked inside Bamboo ,it offers a special flavour . Usha she has been working with our family for a period of more than twenty years.Making sunga peethas with Usha on the day of Uruka is the part I love the most.The sungas are filled with pre soaked rice and little water.Once filled the ends of the sunga are covered by tying banana leaves. Now all the filled sungas are arranged or inclined in a row over the stand which was prepared before.As I mentioned earlier one needs to be an expert to carry out this process….and Usha is one such person.Kids were super excited(mine are in pink and orange jackets),you never see them so happy and joyful while visiting a Mc’Donald’s or a Pizza hunt or a Super Mall.While a continuous flame of very mild kind is required here,a wood fire is not recommended to avoid too much of heat as it will burn the bamboo or sunga…instead Hay is used .At the beginning a small heap of hay is burnt ,to which additional hay is added at frequent intervals by the help of a thin bamboo stick.It is a long process while Usha was busy here and the kids running around here and there we adults were chatting enjoying the bon fire . 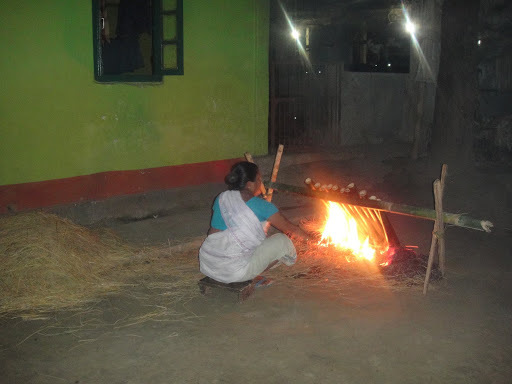 I took this picture to show you how the hay is used here……after a certain time the fire is stopped to turn the sides of the sungas for uniform cooking of the peethas…once turned again the same process is repeated. Cooking outside the house over wood flame is another big attraction of Uruka-feast.The menu ranges from all kind of meats like mutton,chicken,duck and fish(right from our own fish pond).Because i am a strict vegetarian my dishes were prepared in the kitchen…it was a Labda(a mix veg curry),very fresh paneer curry(paneer is cottage cheese…it was freshly prepared at home ) and another fried vegetable dish.Food cooked over wood fire has its own taste….many find it many times tastier than the food cooked over our kitchen stoves. We served the food on special natural plates….the sheets of banana stem are used as plates as you can see here.This picture was clicked while the steaming hot rice was just served to the kids after a heavy session of eating loads of fried fish and fried chicken.After a great dinner we called it a night as we needed to get up very early in the morning to take part in Meji burning. Next morning Usha sliced the sungas to scoop out the pithas. Sunga peetha as a breakfast is a real treat on the day of Bihu…it is consumed with either milk or curd and sugar or jaggery(molasses) as a sweetener.But we needed to wait here because breakfast would be served only after burning of the Meji out in the fields.At this time we the ladies of the house were busy preparing the offerings to the God…..to be continued. 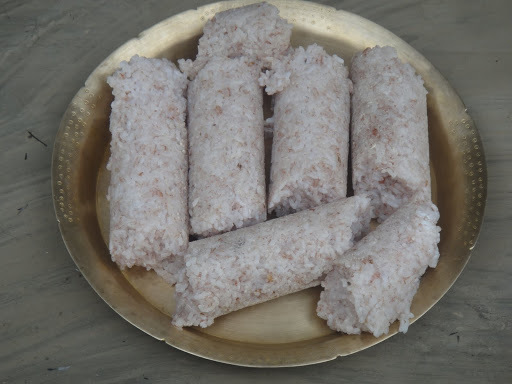 That was a great post .I can relate Pitha to a Kerala dish named Puttu .The snap of the Pitha looks exactly like Puttu but it is prepared with rice flour in steam . Beautiful and interesting post, Kavita. Our kadubu looks like your pitha, only looks. 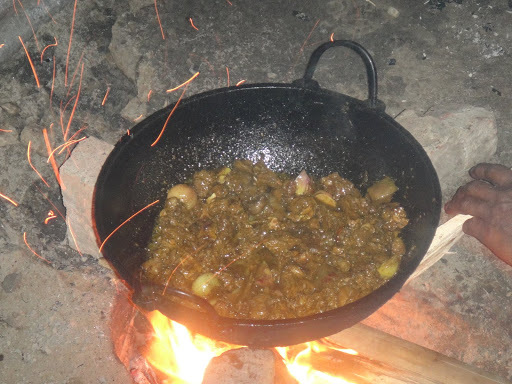 Lotas are made out of a particular leaf, idly batter is filled in it and steamed. Yours is unique and very interesting. Feel like coming there to taste. Thanks for sharing this interesting festival of harvest. Namaste Auntyji. Good post. Really enjoyed the post. Got a bit nostalgic though. I can tell by your photos that this is a very special, very HAPPY time. I look forward to hearing (and seeing through your camera) more of this very interesting festival! excellent narration and self-explaining photos ya…gr8..nice to c u guys had a gala time with the festivities..ya..Thanks for sharing this interesting festival of harvest. Excellent narration…This year I was lucky enough to taste this pitha bought over by my Masi and lil sisHappy Festivities. Another marvellous post. Really elaborate traditions. Feel like visiting Assam someday. Looks and sounds like quite a festival. excellent narration.Please keep sharing such information on festivals and much more. @BHAVYA.B….Thanks dear.After your comment i did little goggling and saw Puttu,you are right it looks exactly like sunga pitha. 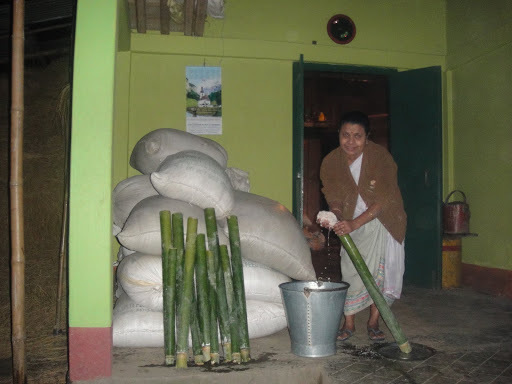 @SANDHYA…Thanks.I saw Kadubu too,the preparation is extremely interesting,this lady used Jackfruit leaves to make a lota,it was unique too.Thanks for mentioning it,i learnt something new today. @PRIYANKA KHOT…Thanks,yes we sure had a great time,it was a relaxing trip after my action packed Delhi trip. 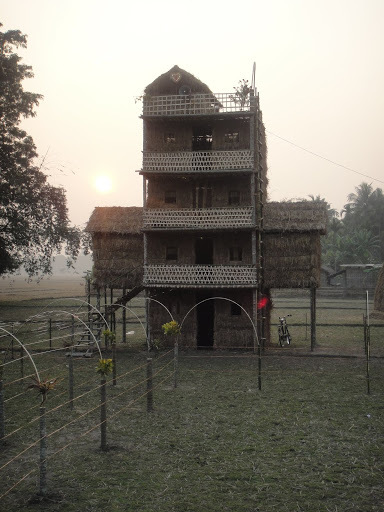 @PRAMATHESH….Thanks.I really wonder my most of my post make you feel nostalgic…don't you live in Assam? @LIN..Thanks.Yes it is a very happy and festive time all over our country.We celebrate it in different names but the basic reason remains the same. @CLYTIE…Thanks.I am glad you enjoyed the post. @RAMESH…Thanks.Nice to see you here after a long time. @TARUN MITRA…Thanks.Welcome aboard.How very nice of your masi and her daughter to get you these tasty delights. @HOLY LAMA…Thanks, please do visit Assam sometime. @SHILP GARG…Thanks.The pictures make the post extra long but they do help in explaining the point.I am glad you found them helpful. @MARGIE….Thanks.I am very happy to see you back healthy and fine.@PATTY…Thanks. @BK CHOWLA.Thanks. Lovely post, lovely pictures.The Bengalis also cook various kinds of pithas for Sankranti but this was totally new for me. The process looked elaborate but interesting and no wonder the kids were so excited. The winter time, the ancestral home, the festivities, it must have been a happy time for them.Welcome back and a Happy New Year. 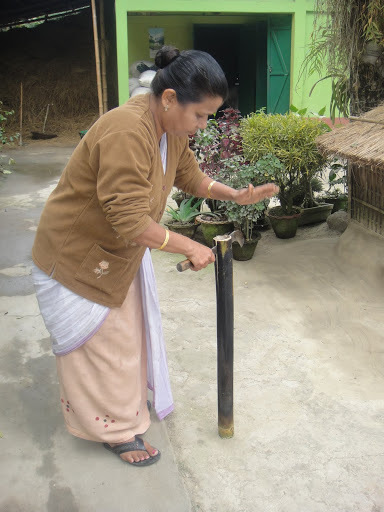 Looking forward to your stories of Bihu. First things first!! !Congratulations on your own domain. You have a better identity now Kavita! Good going :)As always, yet another interesting post. thanks for all the details. yam…yam….yam…..abhi to bas itnaa hi…baaki baaten baad men….aur haan badaa majaa aayaa…sach….!! hmmm. I wonder if Indian sticky rice is just like Thai sticky rice. Do you know?I always order sticky rice when I dine at Thai restaurants. WONDERFUL!!! wow!! this is amazing and so new to me. 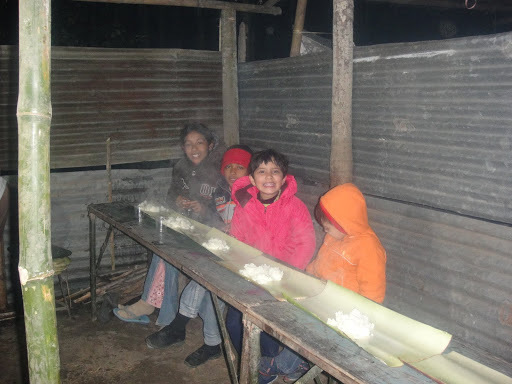 Imagine cooking within a bamboo, the kids look lovely and super excited!! You narrated the entire process so well and I just loved the pics. Its clear you took them with care keeping this post in mind. There is so much of documentation in your posts on the traditions of your land that this needs to be archived very carefully. This is becoming a treasure, you realise that dont you? So nice pics and your narration Kavita, its really great is nt it to be at village home town, space, lushly vegetation, friendly people, i miss those days. This and other posts show your keen observation power. Bhog, I think everybody would benefit from celebrating Bhog once a year. Beautiful post. I miss 'Sunga Peetha' a lot. This used to be one of my fav dish. Nice post. Thanks for explaining it in detail. THAT WAS SO INTERESTING!sunga pitha must be so yummy too! First of all i am extremely sorry to respond to your comments so late …it was all because i was not keeping well for last few days. @APARNA..Thanks.Yes,we all had a wonderful time.Sunga pitha preparation is a real unique thing..i was almost sure of it.I am glad you liked the post. @DESTINY'S CHILD..Thanks for this encouraging comment. @MOHAN..Thanks.I am happy that you noticed my newly acquired domain. @BHOOTNATH..Thanks.Welcome here. 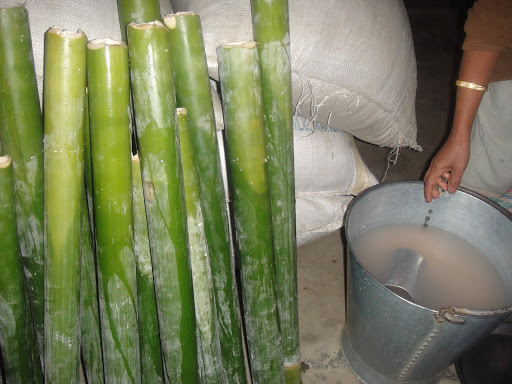 @SUMANDEBRAY..Thanks.One of our friends cook chicken inside the bamboo,my husband and my daughter say that is very tasty. @GIGI…Thanks.You are right here,it is the same Thai rice.@AMATAMARI…Thanks. @BIKRAM…Thanks.You are most welcome here. @NISHANT NISCHAL…Thanks. @NEHA..Thanks dear. @SUJATA…Thanks.Now a days if i find something interesting i record every single detail of it with my camera …keeping a post in my mind.Pictures are a great help in explaining the things i want to share here. @CHITRA..Thanks.You are right i am yet to complete my series on that wedding but due to my daughter's ongoing exams(assessments)i have not been able to dedicate my time to that particular post.Preparing that kind of post needs a lot of research and time.Please wait for some days more…as soon as i have more time i will fulfill my promise. @SUFFIX…Thanks,don't we all miss our home.I hope very soon you get a chance to visit your village. 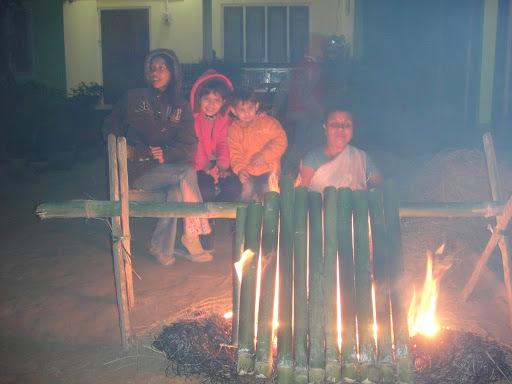 @RAJLAKSHMI..Thanks,were you at home at the time of Bihu? @JADU SAIKIA..Thanks.I am glad you liked the post. @ONKAR..Thanks for your kind words. @167 DAD..Thanks,hey,how have you been? @MAGIC EYE…Thanks,yes it is very yummy and makes you extremely sleepy after you eat it. @RAMESH..Thanks.